First things first: the craftsman doing the vast, vast majority of the recent restoration work shown here is Lyle Roberecki (shown mounting up the M&H's below in an early picture, and with the almost completed car in August 2006). I take no credit for his talent or efforts. 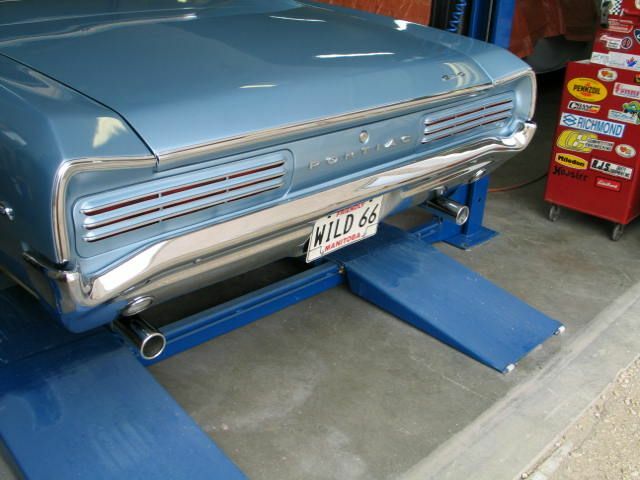 The 3" X-pipe exhaust system was completed. The car was registered and put on the road. Then more problems. The brakes would start building up residual fluid pressure after about a mile of driving, then the shoes would all start dragging. The solution was to either park the car and let everything cool down again, or open a bleeder screw to relieve the pressure. Neither solution made driving the car any fun. The source of the problem eluded even the sharpest, most experienced car-folk. As as result, the car didn't move much in 2007, and not at all in 2008. 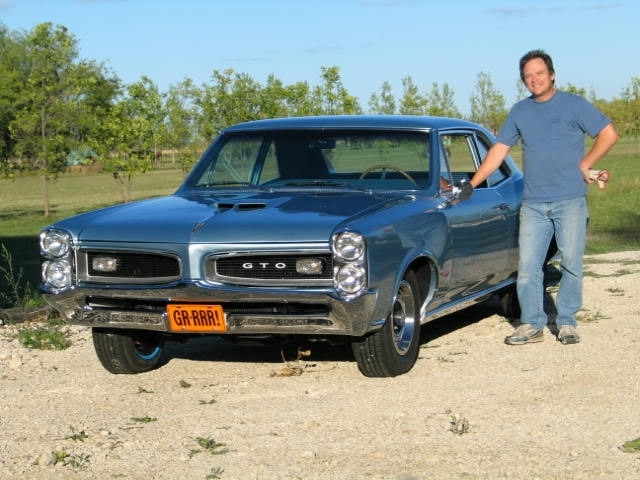 Finally in 2009 the brake problem was resolved, and the GTO could finally be driven, albeit on just the center carb at first. The problem front carburetor was finally rebuilt. And WOW do the end carbs make a difference! 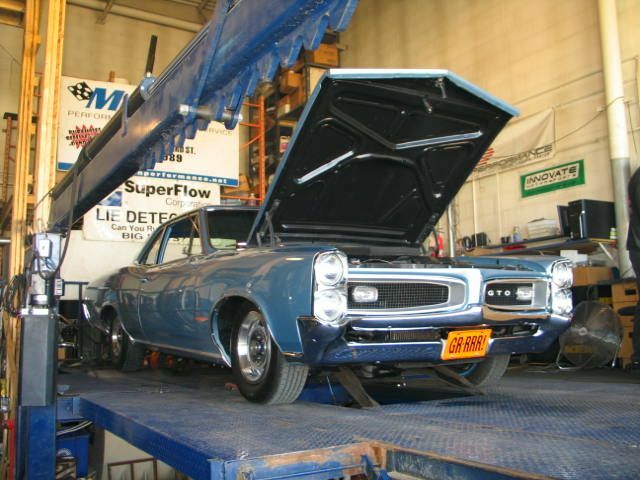 For fun, the GTO was taken to the chassis dyno "lie detector" in August, just to get a baseline before any serious tuning or blueprinting. The results were a bit of a shock. 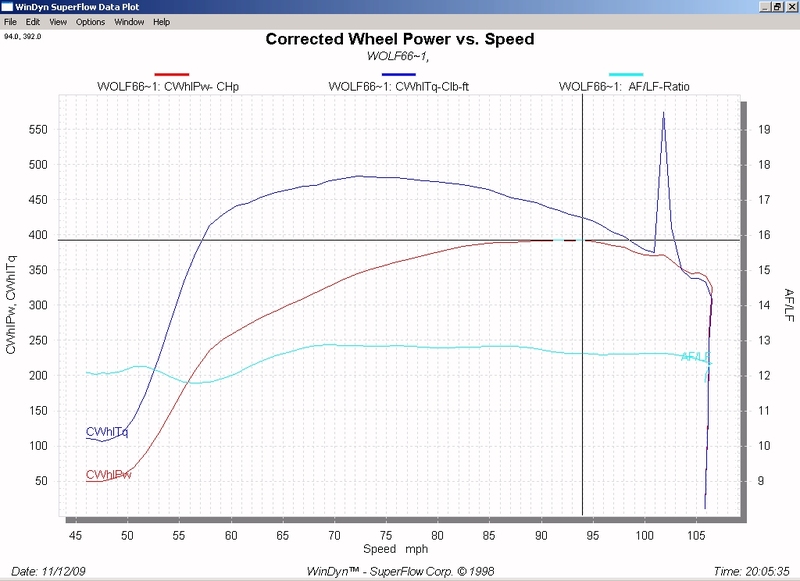 I was hoping to break 300 RWHP with the current (hurting) combo. Well it damn near broke 400 RWHP, through the mufflers, with all Pontiac engine parts, leaking rings, the mystery "ticking", and no blueprinting or tuning whatsoever. The torque was insane. All old school: carbs and points ignitions. The spike in the torque curve is the result of the stock GM ignition points bouncing at higher RPM. I suppose I should replace them with heavy duty points, or even some kind of modern technology. I guess I got to get after building a stout rear end and transmission before I can put the slicks on and start beating on it. Hopefully the next update won't be in another 3 years. Again, a long time without an update. Well, lack of summer vacation, moving to a new house, and getting married will do that. Since the last update lots has happened. 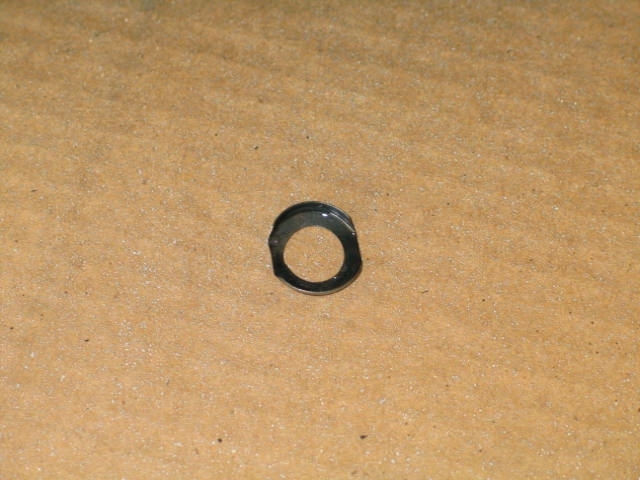 I did find the missing lifter clip (below) in the engine valley, so it saved me from completely removing and disassembling the engine. 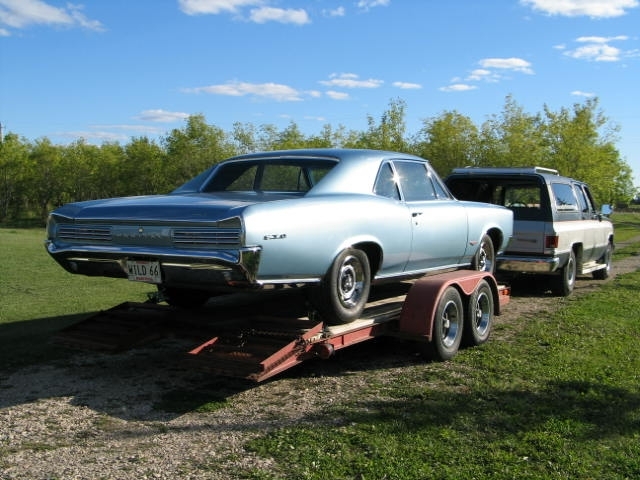 Once the clip was found, we loaded up the GTO to move it to its new home (my new house), where I could deal with the engine issues. First off, since I had no trust for the remaining lifter clips anymore, I replaced them all with real internal retaining (snap) rings. Then more bad news. Despite my efforts at preserving the engine for 20 years (regular oilings, etc.) while it patiently waited for the rest of the car to be completed, somehow (nobody can actually explain when or how) water got into the engine. It had to have happened within the last year, since I replaced the rear main seal in 2005 with a neoprene type, and all was minty inside the engine at that point. I discovered the water problem after reinstalling all the lifters, and tightening up the rockers. When going through the firing order to set the lifter preload, the engine locked up, hydrauliced from the water in cylinder #4. 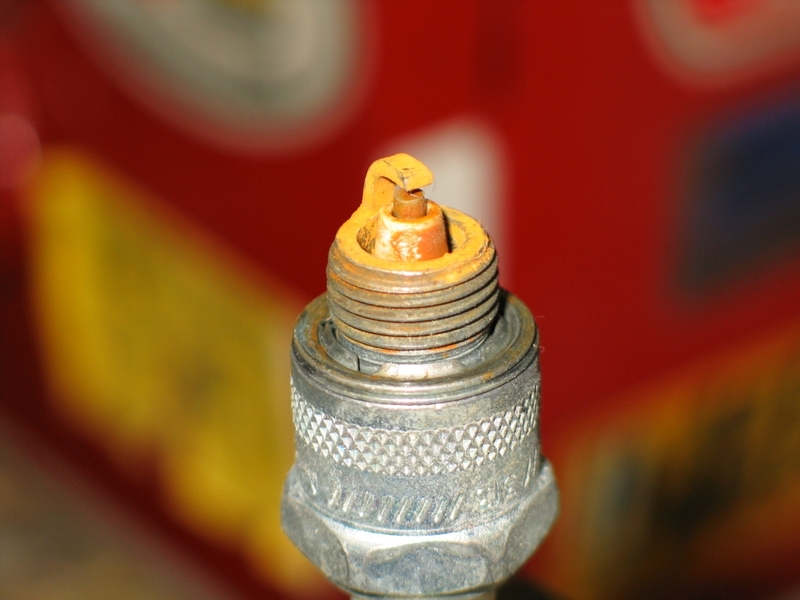 The spark plug shown below is from that cylinder. After draining cylinder 4, evidence was found that water had been in the intake manifold. Since the water was very orange when it came out (see the plug above), the water was likely in the intake for a while. When I finally started tightening up the rockers, and valves started to open now, the water must have drained into a couple of cylinders (mostly #4). A post mortem leakdown test showed several leaking valves (seats have likely corroded), and some cylinders with less than stellar ring seal. Damn, 20 years of preservation effort shot to hell. Depressed and frustrated, I decided to still press ahead with the damaged engine, and debut the car at the largest local car show (and conveniently close to home), since it was also the last major show for the season (I also was determined to have it running for my wedding, in case there were photo opportunities). Lacking completion of the exhaust system, I knew it would have to be trailered there, but it would still have to run to get on/off the trailer and show grounds. Then more bad news. One of the front suspension springs went soft, and the car leaned badly in that direction. With no time (nor money at this point) to replace the springs, I just had to jam in a bunch of spring spacers to level out the car for the show. Then even more bad news. Despite previously pressure testing the fuel system (and nothing leaked), when I finally went to start the engine, carbs were overflowing fuel from the airhorns! Pulling off some airhorns, I found the carbs completely gummed up. With no time to clean and rebuild 3 carbs (this was now the day before the show), I replaced the needle/seat in the front carb with some old parts I had lying around, cleaned up the float pivot, then disconnected the linkage to the end carbs altogether (the center carb didn't leak). Shortening the already long story....the engine fired up on the center carb, A/F ratio was right where I wanted it (logged with a wideband O2 system) and the cam was broken in that night. Then it was loaded on the trailer at the 11th hour, and taken to the show the next morning..
At the show, I was completely overwhelmed at the response the car received. 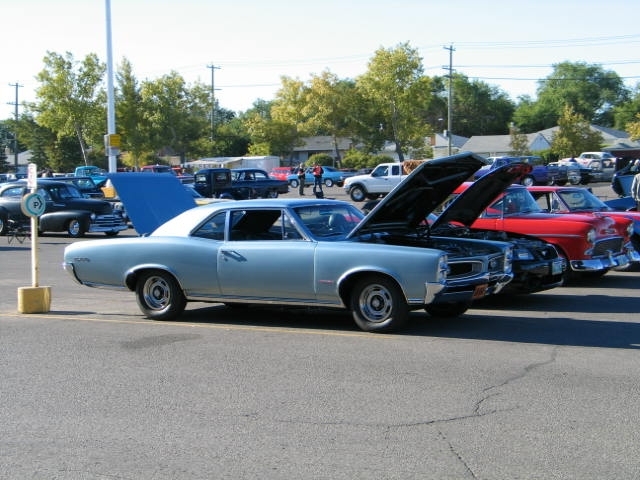 Despite over 1300 cars in attendance, the GTO drew a tremendous amount of attention and complements. 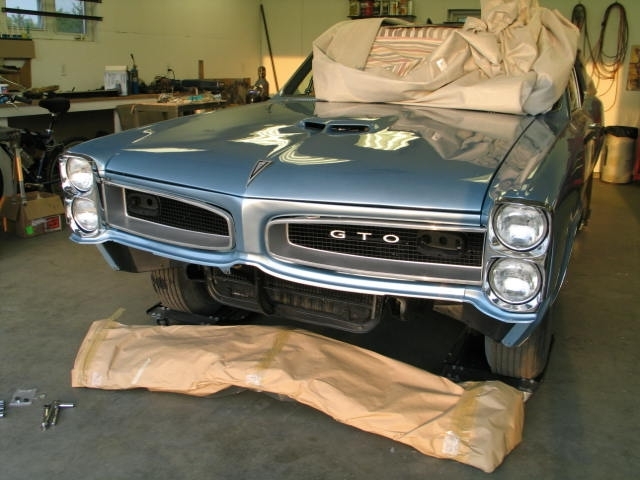 Having a photo history binder on display helped people understand the long and hard road this GTO took to get there. But it's still not done yet. 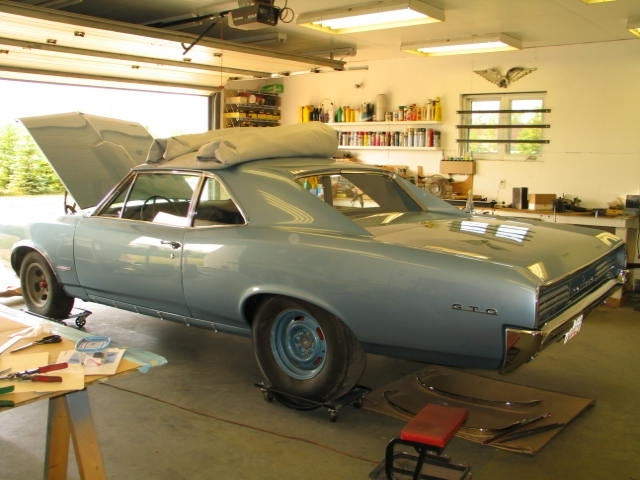 Exhaust needs completion, carbs need to be rebuilt, front bumper needs "adjustment", etc. As for the engine, I haven't decided what to do there. Money is a real problem now with the new mortgage, so I may have to limp around on this engine for a few more years. Well, it's done, sort of. 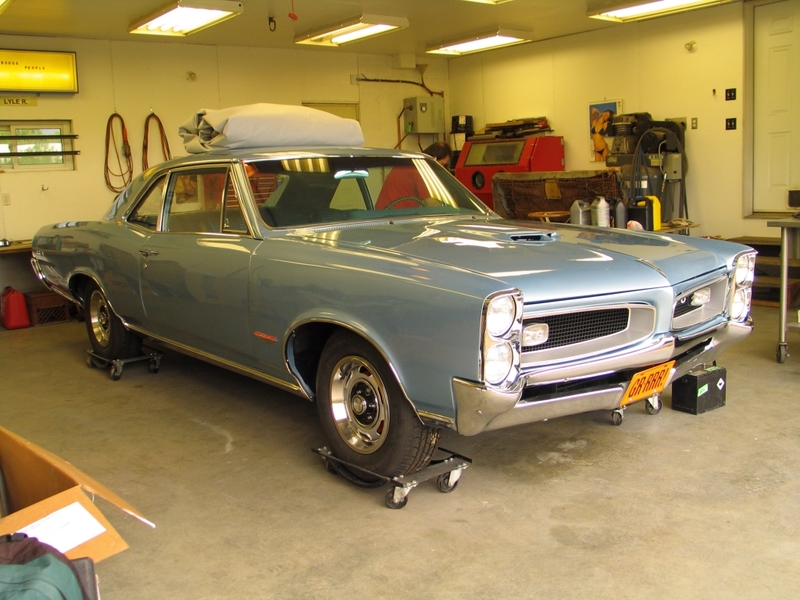 I've been stupid busy dealing with moving, and new house issues, so I haven't seen the GTO much myself. Lyle gave 'er for the last several weeks on the interior, wheels, etc. and now the car is pretty close to complete. I found an afternoon last week to come out and finally get the engine started, but when I was setting the lifter preload (the LAST thing before turning the key), we found a bad lifter (plunger clip was missing, and plunger pumped fully up/out). So we came up just short of driving this thing, and now I need to dig into the engine to assess the situation (ie. if we can't find the clip, the whole engine needs to come out and apart). 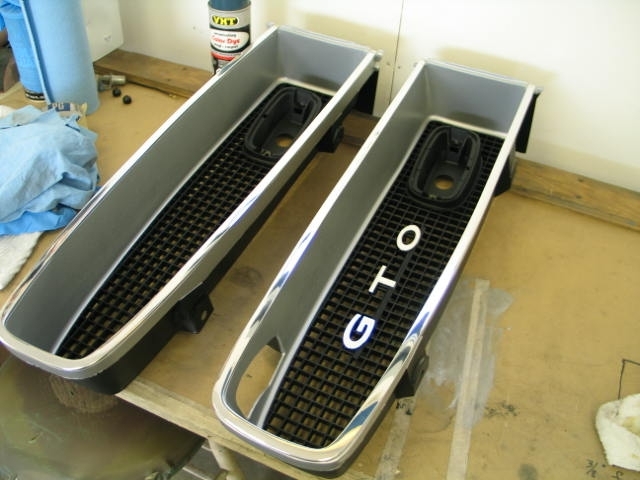 So it may be a while before it makes any actual GTO noises. More months go by without an update, so I get emails asking if I'm still alive. In July, Lyle started aggressively attacking the interior. 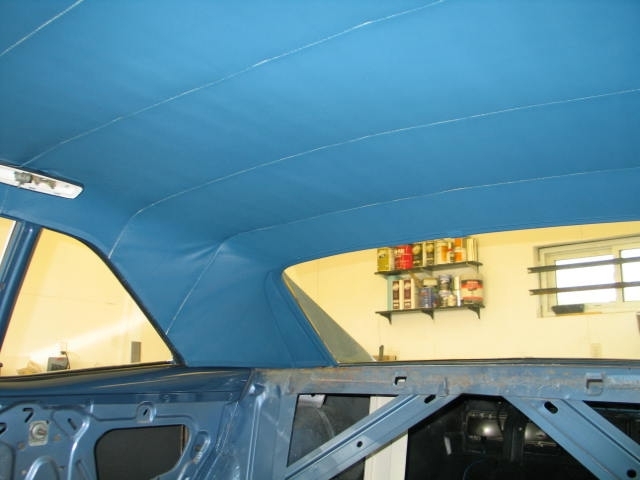 The headliner was a huge job, but the results were awesome. Lyle also found time to restore the grills. I shifted my attention to the front of the car, installing headlights, bezels, front fender trim, etc.